Productivity, that is, the lack of thereof, is one of the major challenges of today’s workplace. 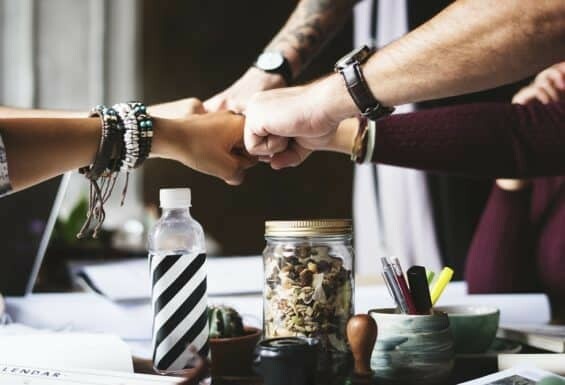 A staggering 87% of employees worldwide aren’t engaged at work according to a research study, and while employers should delve into the causes of this problem and try to eliminate them, there are some simple things that can be done in order to motivate employees. The size of this problem might be illustrated by the fact that disengaged employees cost the U.S. somewhere in the vicinity of half a billion dollars, not to mention that job dissatisfaction increases turnover rates, thus additionally damaging businesses. Here’s what you can do to boost your team’s productivity. People spend approximately 8 to 10 hours a day at work, which is why their work environment has to be positive and stimulating. This can be done by allowing them to personalize their corner of the office. Since open-place offices which are popular these days are full of distractions, it’s a good idea to make sure that there’s a room where your employees can work when they need to focus. Adjustable, standing workstations can also be an excellent way to boost productivity. Even a study has found that employees who use stand-capable desks were significantly more productive than their colleagues who sit all the time. Apart from helping them feel comfortable and pleasant, it’s also important to your employees feel safe. Just like home insurance is something that is a must, workplace safety procedures should be a necessity too. Needless to say, by making the workplace safe, you’re also making it productive. In addition to that, a safe and hazard-free workplace means fewer injuries, fewer expenses, and more profit. Regular communication is of paramount importance for productivity. By not recognizing your employees’ efforts and hard work, you’re making them feel insecure and this leads to frustration, dissatisfaction, and finally disengagement. Many managers think that the fact that they’re not complaining is enough for their employees to realize that their work is satisfactory, but this is a dangerous misconception. Make sure to always recognize and thank your employees for everything they do for your business. An email or a handwritten thank you note can make a big difference. Even if there are some bad things going on, it’s important to discuss them and clear the air because otherwise, you can expect a snowball effect. So, break the silence and address all potential issues while they’re still manageable. Thanks to various advanced technologies there’s no reason to insist that all your workers come to the office at the same time. Not everybody is a morning person, and if you want to boost productivity you should allow your employees to adjust their work hours with their circadian rhythms whenever that’s possible. This means that an employee who likes to sleep in won’t come to the office at 9 AM grumpy and sleepy, but at 11 AM or noon rested and chirpy. Similarly, your employees can occasionally work from home, which means that they’ll be able to avoid distractions and wasting a lot of time while commuting to work. Many managers assess the productivity of their teams only based on how busy employees are and how much workload they’re handling. But this is wrong on so many levels, and their approach is completely counterproductive. It’s OK to have high expectations, but your employees won’t be able to be productive if they’re constantly up to their ears in work. When they can’t manage their workload, their stress levels soar and soon you have a number of disgruntled and unhappy employees who only want to find another job. So, it’s important to assess the optimum workload your team can take on and adjust your expectations accordingly. While meetings are necessary in order to share information, they can completely ruin your team’s productivity if they’re not carefully planned. Although they can be huge time-wasters, you can’t totally eliminate them, but luckily there’s a solution. By creating a goal-oriented agenda and inviting only people who actually need to be present, you will speed things up. It’s also a good idea to hold stand-up meetings which won’t be too long and tedious. All this will help you reduce the number of excessive meetings over time. Too much work and stress lead to burnout, so it’s important to encourage the members of your team to slow down and relax. Also, whenever you’re delegating tasks, specify the deadline, because there’s nothing more frustrating than working over the weekend and discovering that the task wasn’t that urgent and that it could have been finished on Monday. As you can see, boosting your team’s productivity doesn’t always require a hefty pay rise or big investments. It’s more about respecting your employees, recognizing the effort they put, and treating them fairly. Claudia Paisley Propp, graduated journalist, digital marketing lover, based in Sydney. Copywriting, Online Marketing… Lets just say – Communication in all shapes and sizes is her passion and what she does best. She is that lucky girl who gets to live her dream.